4Easysoft MPG Encoder provides perfect solution to convert common video formats to MPG with the best quality of picture and sound. This MPG Encoding software supports almost all source formats, including AVI (AVI to MPG), WMV, MPEG, MPG, ASF, MOD, FLV (FLV to MPEG 1), SWF, RM, YouTube, and HD files etc. You can convert MPG files to MPEG, VOB, AVI as well as MP3 and WAV supported by Creative Zen, Archos, BlackBerry series, etc. In addition, this MPG Encoding tool also has many advanced function and rich settings for video output. 4Easysoft MPG Encoder is easy-to-use with intuitive interface. Whether you are an experienced user or a beginner, converting video formats between MPEG, MPG, VOB, AVI is just in a breeze. 4Easysoft MP4 Converter is a powerful MP4 Video Converter which is designed to convert almost any video formats to MP4 format, such as AVI to MP4, WMV to MPEG-4, easily and fast. 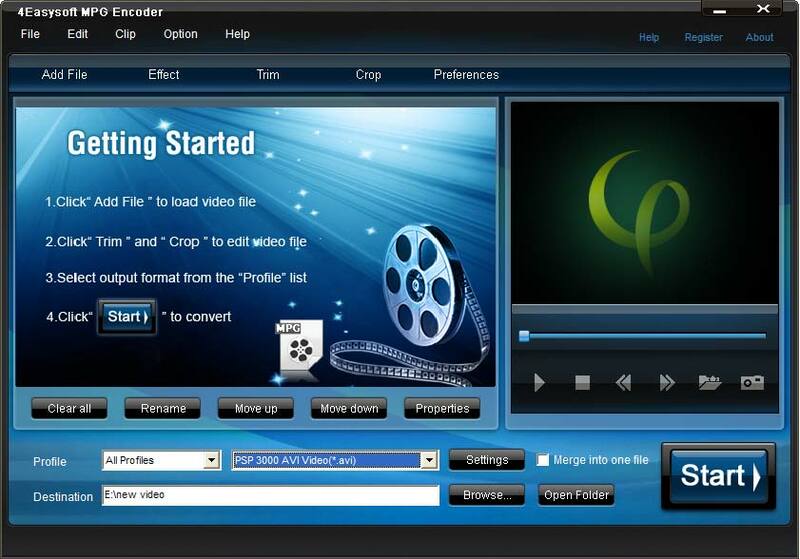 It also provides you with flexible video editing options such as crop video, trim file segment, etc. WMV, MP4, MOV, M4V, AVI, FLV, SWF, 3GP, 3G2, VOB, MPEG, MPG, ASF, MOD, MKV, RM, TOD, MPV, and HD files, etc. AAC, MP3,WAV audio formats and AVI, DivX, XviD, MPEG-1, MPEG-2, TS, VOB, DV, Super VCD(NTSC, PAL, SECAM), VCD(NTSC, PAL, SECAM) , DVD(NTSC, PAL, SECAM). Input file(s) as many as you want and set several different output formats then start converting continuously. 4Easysoft MPEG Encoder allows you to set the video Brightness, Contrast, Saturation. Checking Deinterlacing helps you to convert interlaced video to the progressive video, this function can optimize the video effect. Trim any segment of your video by setting the Start time and End Time or drag the slider bar. This MPEG Encoder doubles your enjoyment with joining several interesting clips into one. Crop off the black edges of video, setting the screen aspect ratio by keep original/ full screen/16:9/4:3. If you like the current image of the video you just click the "Snapshot" button and it will be saved automatically. You can preview the original video and the instant output video for your operation at the same time. Insert image or add text watermark to your video and adjust its position, transparence even text font style, color if needed. Choose the subtitle and audio track before your conversion. With professional video encoding and decoding technique, 4Easysoft MPG Encoder brings you high speed converting process and impress you with best video quality. All of these will bring you stable and free conversion process. Insert image or add text watermark if needed. Input file(s) and set different output formats for converting continuously. Provide selectable subtitle and audio track.